Everyone is trying to make their wallets go farther these days. Packing your own lunch is a great way to save hundreds of dollars each year, but it can get tedious. I love to find inexpensive, innovative restaurants that help make my dollar last longer. Plus, a place that can get me back to work in an hour or less. Takara Sushi & Steakhouse, located in Elm Grove, Wis., is one of my fave places to dine at during the lunch hour and to avoid the monotony of the brown bag blues. Now before you go all, “Sushi…That’s gross. I’m not eating raw fish…” Hear me out. Not all sushi is raw. You can get cooked sushi. Veggie sushi. You name it – it probably can be wrapped in rice and seaweed paper. Or, you could enjoy tempura (fried and battered fish, meat or veggies) or hibachi (the ever-entertaining grilled items like steak, chicken and shrimp and a show). The great thing about lunchtime at Takara – you can get any of the above for a lower price at lunchtime. And, an even lower price on Sundays, Mondays or Tuesdays because of their 30-50% off special. 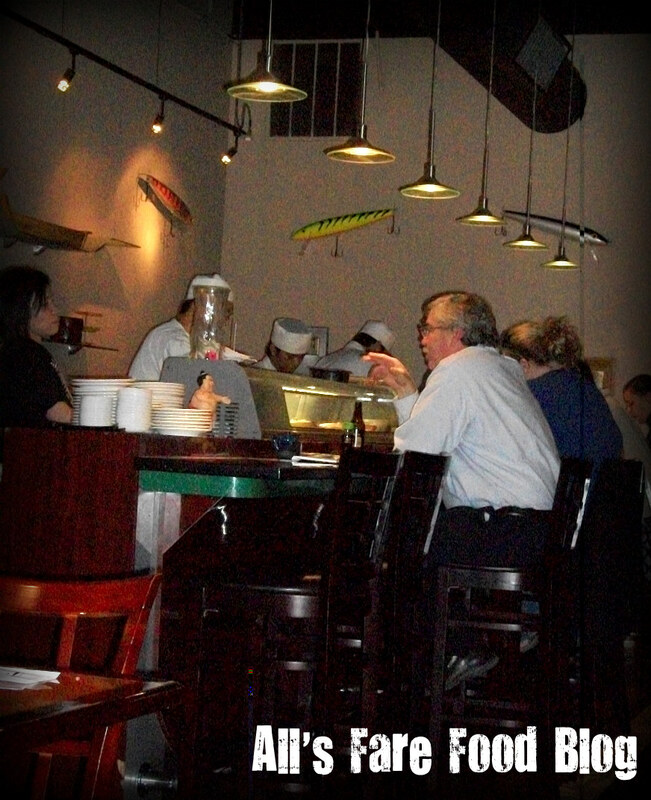 Takara is located on Blue Mound Road, just minutes from Milwaukee and near the Milwaukee Regional Medical Center. On a recent lunch visit, I saw several doctors in scrubs armed with chopsticks instead of scalpels. The crowd isn’t just doctors, but students and local business people from the nearby business parks and office buildings, too. The restaurant is tucked in the back of a small strip mall that includes a fitness center, vision store and wine retailer. With a glittering neon open sign, you walk in to find sake in the glass-lined floor. The restaurant is partitioned in two – an area for hibachi diners and then the more secluded dining area that offers more quiet in booths, tables or near the itamae (sushi chef) at a bar. For the same price of a huge extra value meal at one of those box-looking drive thrus, you can get a freshly prepared Japanese treat. Each day, Takara has lunch specials from $8.95 to $11.95. You could get a bento box (soup, salad, rice, California roll, and then your choice of teriyaki or tempura meat). Or, you could get two sushi rolls plus soup and salad for $8.95. Add a third roll for a few dollars more. But, the best deal of all comes Sunday through Tuesday at Takara. Their half-off deal is amazing. Instead of ordering off the standard lunch or dinner menu, you get a No. 2 pencil and a 2-sided sheet of handrolls, sashimi and sushi that are available for a fraction of their normal cost. 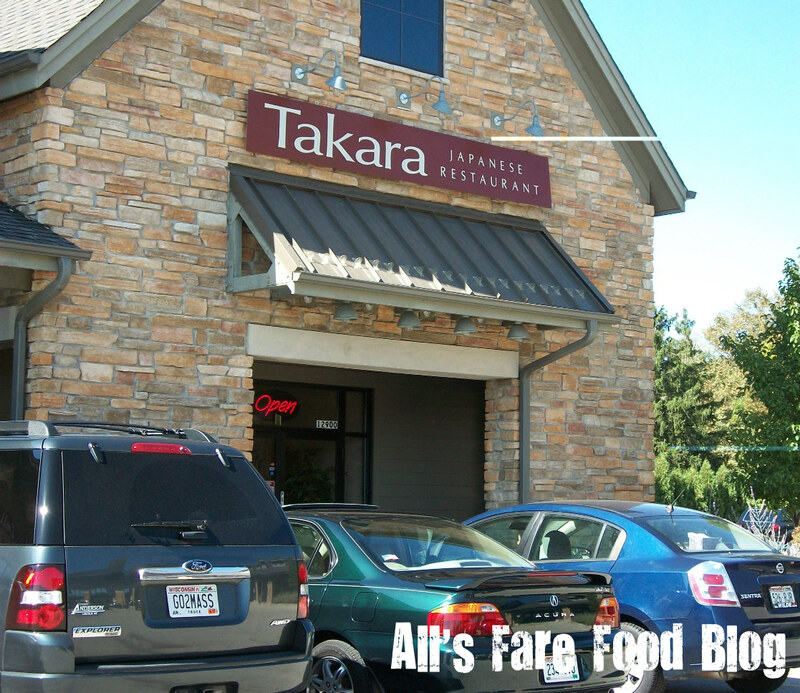 Recently, my husband and I headed to Takara to get our sushi fix on. With this deal, we like to branch out of our box sometimes and just point and be surprised. 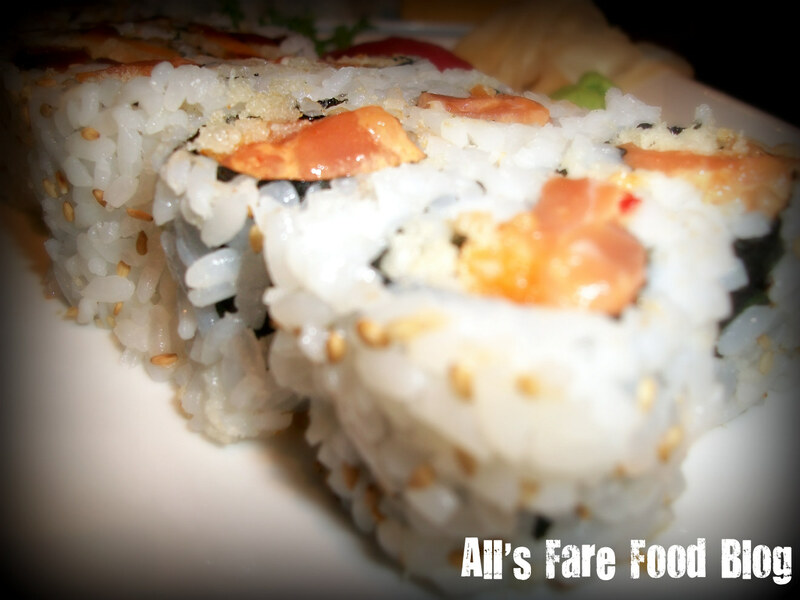 Other times, we stick with tried-and-true favorites like spicy tuna or Philadelphia rolls. (Pictured above) I enjoyed, starting at the left and going clockwise, a kompyo roll. This was one of those point-and-circle moments on the menu. Kompyo is a root vegetable. Here, it’s pickled and then rolled. I would liken it to pickled radish or cucumber. Not a whole lot of taste, but a good option for vegetarians who wants to branch away from sweet potato, cucumber or other veggie-only rolls. Next, I filled my plates with selections of some of my favorites. 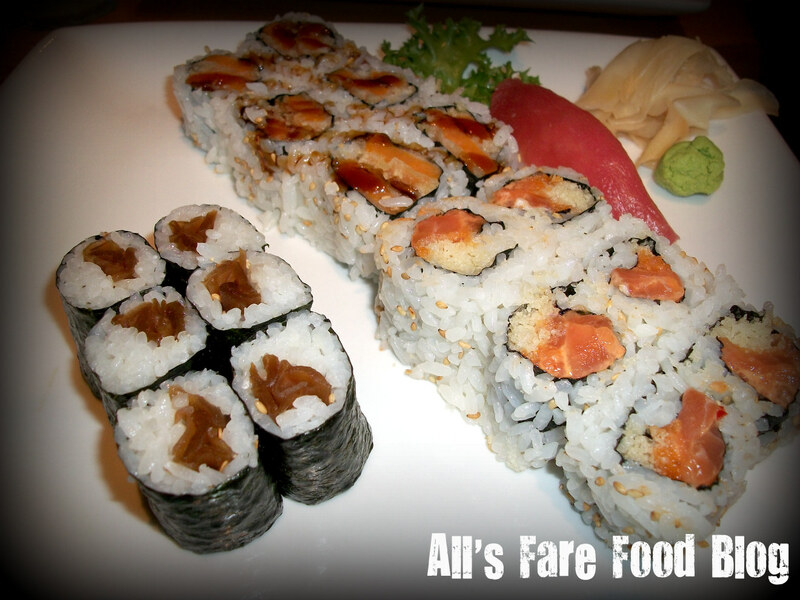 Sweet potato roll, salmon sashimi and spicy tuna. The sweet potato is always amazing. I love its creamy texture, flash-fried exterior, and how it pairs so well with just a touch of soy sauce and pickled ginger. The salmon sashimi melts in your mouth and the spicy tuna is a great kick to alternate between the kompyo and sweet potato rolls. (Pictured above) My husband also chose the sweet potato roll (top left). He added to his plate a spicy salmon roll and spicy tempura shrimp roll. The yellow pineapple-looking sashimi in the right of the photo is sweet egg. It had the consistency of a soft tofu but tasted like bread pudding. I may indulge in this one myself next time. We purchased a total of six rolls plus two pieces of sashimi each and two beverages. The grand total including tip came to $28.50. I also had enough left over for lunch the next day. Takara also has two locations in Madison, Wis. Find out more at www.takaramilwaukee.com. Need more sushi etiquette lessons? Here’s a great article from a few year’s back in the Milwaukee Journal Sentinel on the do’s and don’t’s of sushi-eating. Have another budget-friendly spot to dine at? Let me know! Leave your comment below or Tweet me @CRelacion…I love to hear from you! P.S. Takara also has bubble tea. If you don’t know what it is, just order it. Try the coconut or Thai flavors. 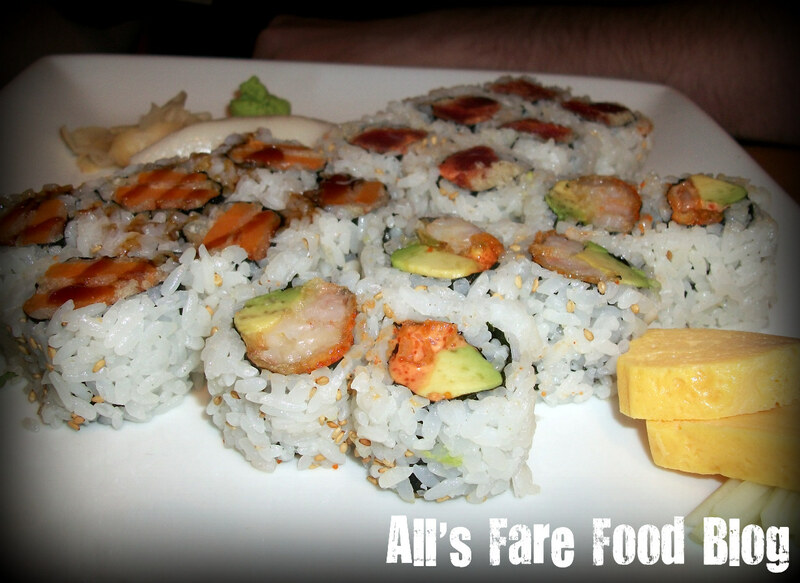 This entry was posted in Cuisine - Japanese, Places - Milwaukee and tagged bento box, California roll, Elm Grove, hibachi, Japanese, kompyo, lunch, Madison, Milwaukee, sashimi, sushi, Takara, tempura, teppanyaki by Christina. Bookmark the permalink.